Cuba’s maritime transport system of waterways, ports, and intermodal connections played a dominant role in Cuba’s early settlement and growth. As an island state, Cuba depends heavily on marine transport for commerce, and thus, the well-being of its people. However, the Cuban marine transport system, like other parts of its national transport infrastructure, has been in a state of long-term deterioration due to a persistent lack of maintenance and supply of equipment. Cuba’s extensive coastline of approximately 2,200 miles and 70 ports can help stimulate regional growth and economic development. To help Cuba take advantage of its geographic position and compete in a global trading environment, a robust marine transport system with efficient waterways and ports with links to rail, trucking, barge, and pipeline operations will be necessary. Low-cost barge transport growth could also complement Cuba’s overall transport system by alleviating land-based transport congestion and thus increasing productivity. Due to the importance of linkages between Cuba’s maritime assets and other modes of transport on the island, the need to rapidly evolve intermodal aspects of its transport system is critical. To achieve a seamless global supply chain, dependence on technology and connectivity will become a high priority for a free Cuba as the volume of cargo increases. Additionally, if Cuba is to conform to the recent “24 hour manifest rule” mandated by U.S. Customs Service, investment in technology and training will also be required. A Cuba in transition could accelerate its economic transformation by adopting key components of successful transformation programs implemented by Eastern European countries. For example, Estonia’s economic transformation is considered among the most notable in Central and Eastern Europe. Since its independence in 1991, Estonia has made significant and rapid progress in its transition to a market economy. A combination of key policies, including commitment to privatization, adoption of an independent currency, establishment of an extremely open trading regime, and successful attraction of foreign investment, have made Estonia one of the success stories of the region. As a result, Estonia was one of five Central European countries invited by the European Union for membership talks and became a member of the EU in May 2004. Paljassaare Harbor—timber, oil, coal port, max depth 9 m.
Passenger traffic from Tallinn to Finland, Sweden and Germany is organized by several companies and the amount of connections per day is increasing year by year. Tallinn is the centre of Estonian political and business life. With its population of more than 400, 000, the capital is the driving force of the country’s economy. The city is home to about half of all Estonian companies, which are responsible for about 50–60% of GDP and nearly three quarters of total business profit. The economy is closely connected with the neighboring Scandinavian countries. This has attracted extensive foreign investments, facilitated the acquisition of modern expertise, and boosted trade. In the Port of Tallinn, the Old City Harbor is the main port for passenger traffic, but it also provides Ro-Ro and Lo-Lo services, and has a container and general cargo terminal. Muuga Harbor handles liquid and dry bulk, general, and reefer cargo, and has facilities for Ro-Ro and container handling. It also has storage areas for vehicles and timber. Construction of both a new container terminal, with the capacity of 250,000 TEU per year, and of a new steel terminal was recently completed. Paljassaare Harbor has terminals for both liquid and dry bulk and for general cargo, including a reefer complex. The Paldiski South Harbor handles mainly scrap metal, timber, dry bulk, peat and Ro-Ro cargo. Construction of a new quay, which is meant for peat handling, and will be equipped with modern conveyer equipment, is underway. The Port of Tallinn operates as a classic landlord port owning only the infrastructure; the superstructure and equipment is owned and operated by private operators. Other ports and their facilities (superstructure and equipment) are privately owned. After passing an ownership act in June 1990, the government began a privatization program at the beginning of 1991. Most of the nearly 500 state-owned companies have passed into new hands. The Estonian Privatization Agency (EPA) was established to oversee major privatization programs. In late 1995, EPA announced privatization plans for Estonian Railways, Estonian Energy, Estonian Oil Shale, Estonian Telekom, and Tallinn Ports. Estonian Gas, Estonian Tobacco, and Estonian Air were privatized in 1996. Immediately after the restoration of independence, the Estonian Government made an explicit commitment to privatize virtually all state-owned enterprises as quickly as possible. Smaller enterprises were sold by auction to the highest bidders for cash. As the process was relatively straightforward, sales of small enterprises proceeded quickly and nearly all such enterprises were sold by the end of 1994. Privatization in Estonia has been decisive. It is best illustrated by the fact that almost two-thirds of the nation’s GDP comes from the private sector. The central element contributing to the major progress has been a streamlined and centralized privatization process, which has welcomed foreign investment. Initial emphasis on selling majority stakes to strategic investors has helped attract fresh capital and knowhow and raise productivity. Estonia’s privatization program has been among the most ambitious of those adopted by the states in Eastern/Central Europe. Due to this, over 80% of formerly state owned enterprises have been privatized in Estonia. Due to its favorable economic and geographical position, Estonia has become a transit gateway for eastwest as well as north-south connections. Its location is ideal for the creation of efficient transportation links and distribution chains of goods and services for companies in Europe and in other parts of the world. Due in part to the aggressive free-market economic transformation programs and its privatization strategy, the vessel traffic through Estonian ports has increased steadily. In 2005, 15,893 vessels came from abroad to Estonian ports; 47.1 million tons of goods were transported through ports, three times more than in 1995. Almost half of loaded-unloaded goods were petroleum products carried as transit. 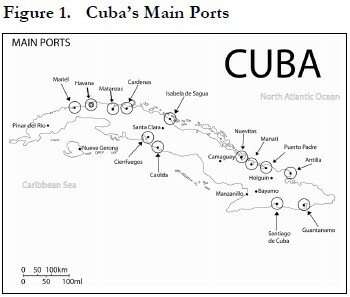 Ten of Cuba’s ports can be categorized as major, including Havana (60% of all cargo uses the port), Matanzas, Santiago de Cuba, Cienfuegos, Nuevitas, Caibarién, Guantánamo, Cárdenas, and Mariel. Cuba has an extraordinarily large number of good harbors, among which are bottleneck harbors with narrow entrances but commodious anchorage. The main harbors of this type are Bahía Honda, Cabañas, Mariel, Havana, Nuevitas, Puerto Padre, Nipe, and Tánamo on the north coast, and Guantánamo, Santiago de Cuba, and Cienfuegos on the south coast. 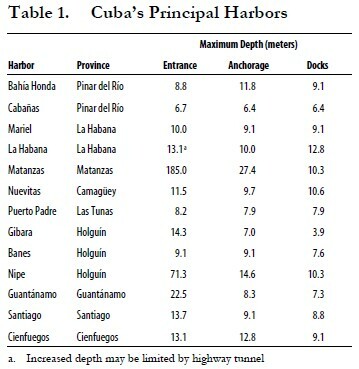 The principal open harbors are Matanzas and Cárdenas (see Table 1). Sound physical infrastructure is required for any country to develop and sustain economic growth and quality of life for its citizens. It is the backbone of social and economic development, and for a transitioning Cuba, it will be critical for success. After years of inadequate investment and neglect of repairs and maintenance, Cuba’s infrastructure is in a state of serious deterioration. All basic infrastructures, including transportation, energy, telecommunication, and water and sanitation facilities have suffered, and all such systems are antiquated, unreliable, and incapable of supporting the increased demands associated with an open, consumer-oriented, market-based economy. Infrastructure development and maintenance is capital intensive. For nearly 30 years, Cuba received large subsidies, principally from the former Soviet Union, and mostly via concessionary sugar-for-oil agreements. Wasting this capital on military adventurism, the Castro regime ignored the day-to-day infrastructure needs of the nation, which is in part responsible for the long-term damage to the economy. Since the Soviet Union’s collapse in 1991 and Cuba’s loss of what had been a $6 billion a year subsidy, Cuba’s state-planned economy has had difficulty generating sustainable revenue. Capital shortages are reflected in a pattern of deferred maintenance and a lack of renewal of the country’s infrastructure, including its ports. Even before the break-up of the Soviet Union, Cuba’s showed the damages of its ideologically based, state-planned system, with its distortions and misplaced subsidies that favored inefficient operation of state-run enterprises for political reasons at the expense of market-driven production. During the last 30 years, the Cuban government has used a strategy of abandoning certain older port facilities and concentrating its resources on improving and developing new port infrastructure. The areas identified for development are the ones considered to benefit the Cuban government’s military and commercial objectives. The objectives include the movement of specific goods through seven regional port agencies, which in some cases may represent as many as 12 different ports as is the case with the Oriente regional port. The net effect is that some ports have been designated as import only or export only or transshipment centers or “specialized” ports with various infrastructure and equipment results. The port strategy utilized by the Cuban government has resulted in a diverse network of ports capable of managing the water transportation needs of the island’s most critical import and export commodities. For example, large amount of investments, which took place in the Port of Matanzas prior to 1989, now allows for 150,000–ton oil tankers to discharge crude oil. The crude oil is transferred through oil pipes underground to refineries located in Cienfuegos and La Habana, while substantial dredging activity now allows for large coastal barges to satisfy the import requirements of a growing region in the Isle of Pines, from Cienfuegos to Nueva Gerona (see Table 2 and Figure 1). 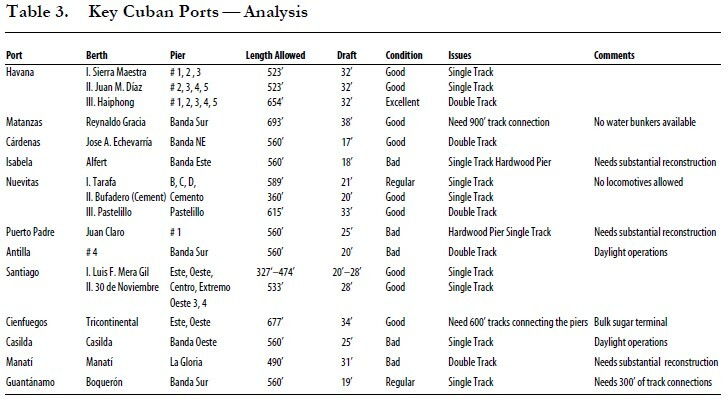 An analysis of the ports is given in Table 3. By far Cuba’s largest dilemma, concerning its ports, is the accelerated deterioration of its equipment due to the lack of spare parts and funds for maintenance and replacement units. Although purchased from Japanese manufacturers, Cuba’s fleet of forklifts is at least 12 years old. Cranes are of Japanese, Swedish, Finnish, German, Hungarian and other east European, including Russian, origin. Trucks for the movement of material are generally unavailable due to the lack of fuel and general disrepair. At present, the Cuban Ministry of Transportation (MITRANS) is the institution responsible for maritime civil transportation, including auxiliary and connective services. It administers, on behalf of the Cuban regime, an enterprise system composed of more than 250 public and private enterprises as well as joint ventures. The container terminal of Havana Harbor (TCH S.A.) is a 50–50 joint venture between Cuba and Spain, formed in 1998. TCH was originally budgeted for traffic of 180,000 TEU1/year being reached by the end of its 15–year concession (with a 5–year option) in 2013. The facility has the technical ability to handle cargo with very modern, complex, fully outfitted equipment. However, Cuba’s frequent blackouts make the entire system unreliable, as equipment and refrigeration units can not function without power. Also, the generators are old and break down regularly, and are a challenge to repair without skilled labor and easy access to replacement parts. In 2003, the port of Havana handled a total of about 300,000 TEUs. The only gantry crane equipment in Cuba is located at the Port of Havana. The gantry cranes, many manufactured in Eastern Europe, can handle primarily 20–ft containers. The road system could possibly accommodate 40–ft containers but the trucking capacity is not known. There is no railroad equipment to accommodate 40–ft containers. Cuba’s government-operated Cubanco S.A., a joint venture between the Cuban Ministry of Transportation and Silares Terminales del Caribe NV, currently operates cruise ship terminals at the Port of Havana, the Port of Santiago de Cuba and on the Isla de la Juventud. The company constructed a fourth passenger- ship terminal at the Cuban port of Cienfuegos. The cruise terminals are adequate for smaller cruise ships. Intermodal transport is critical for Cuba’s economy and expansion of foreign trade. Cuba, however, would need to develop sophisticated logistics and supply management expertise to integrate its transport system into customer-oriented, end-to-end services. Any development of intermodal transport would necessitate a level of normality in the transportation network before embarking into more sophisticated integrated networks. This process is hampered because Cuba’s continuing economic crisis has dramatically slowed the pace of motorization while the Castro regime ensured that development has been tightly controlled. Mariel—Mariel is one of Cuba’s most strategic ports. It handles principally cement, sugar and fertilizers cargoes as well as containers. Vessels with up to 167m (548 ft.) in length and a maximum rate of 9.1m (29 ft.) may use the port. The harbor channel is approximately 125 yards in width and leads between the foul ground extending up to about 300 yards from the entrance points. The channel has a least depth of 10m (32 ft.); within the harbor, depths range from 9m to 14.6m (29 to 47 ft.) decreasing gradually to its head. A quarantine port of Havana, Mariel contains a large quarantine station and a key naval base. Mariel has the greatest possibilities for development in the Western part of Cuba and at the same time it is very close to Havana. It is particularly interesting when evaluating new options of transshipment due to the fact that it is close to the main ports of North and Central America. The port equipment includes 5 shore cranes (10 to 20 tons capacity). Mariel’s free zone is considered an important logistics factor for future marketing development. Matanzas—Matanzas is the country’s third largest port, with a large, deep harbor with deep oil terminal. Industries in the city include sugar refineries and textile mills. Matanzas is important for transshipment services to the Caribbean of bulk and bagged fertilizers. It is also linked to the national railway system. The port also operates the port of Cárdenas that provides tourist ferry traffic to the province. A significant sugar exporting area, the harbor area adjacent to Bahía de Matanzas has a free trade zone at San Servino Castle. Several piers are available to vessels working bulk petroleum, sugar, molasses and alcohol cargoes. Alongside depths range from 6.7 to 11.2m (22 to 36 ft.). As of 1990, it was still in progress to develop the port to accommodate ships up to 150,000 dwt and 17m (56 ft.) draft. Reportedly, there are two pies that can service vessels up to 50,000 tons and two additional piers to accommodate vessels up to 70,000 tons. Also, reports indicate the presence of a gantry crane for handling containers as well as the existence of an oil pipeline between Matanzas and Cienfuegos (on Cuba’s south coast). Cárdenas—In the province of Matanzas, Cárdenas is Cuba’s northernmost port, the second most active transshipment center for exporting sugar and the site of a considerable fishing industry. A fishing fleet is based in Cárdenas. The shallow bay opens to 9 miles in width, northwest to southwest, from 6 to 10 miles long, west to east. The port has one pier and is 1500m (4920 ft.) long with six berths. Ample warehouse space is available with adequate cargo-handling facilities. At last report, the maximum draft alongside was 6.2m (20 ft.) at any stage of the tide, and 6.7m (22 ft.) at high tide. Caibarién—A major transshipment center with numerous facilities for the accommodation of lighters shuttling to and from comparatively deepwater anchorage. Lighters accomplish loading and unloading, but operations are suspended in bad weather. There are several wooden piers, ranging in length from 43m to 847m (140 to 2780 ft.). Nuevitas—Nuevitas is sheltered by a huge harbor, has two auxiliary ports, and is a major shipping point for Cuban sugar as well as other products from the surrounding agricultural region. It also possesses diversified light industry and serves as a road and rail terminus. Ports handle about 6% of total sugar exports and have cargo facilities for bulk grain handling. Nearby are a thermoelectric plant, fertilizer and cement plants. Together with nearby deep-water berthing facilities at Pastelillo, Punta Bufadero and Puerto Tarafa, the port of Nuevitas serves the city of Camagüey, about 45 miles WSW, and serves as the leading sugar transshipment center in Cuba. Tankers up to 14,000 dwt can use the channel without difficulty. The Tarafa terminal consists of three concrete piers with berths up to 146m (480–ft.) allowing maximum drafts of from 5.8m to 7.9m (19 to 26 ft.). The cement dock as a length of 84m (275 ft.), with an alongside depth of 4.2m (14 ft.). The Pastelillo pier has lengths of 140m (458 ft.) on each side and allows a maximum draft of 10m (33 ft.) on each side. All of the Nuevitas port installations are located on this pier. Puerto Guantánamo—On the Guaso river, this port comprises Bahía de Guantánamo’s inner part and serving the amply populated city of Guantánamo, Cuba’s coffee-growing center, about 8 miles northwest. The maximum length of a vessel sailing to and departing the port is 186m (610 ft.) with a draft of 5.8m (19 ft.). Tankers are not restricted by length of the pier. Boquerón Dock is 168m (550 ft.) in length with an alongside depth of 5.8m (19 ft.). At Guantánamo Bay, the United States maintains an important naval station. The base has naval installations covering about 45 sq. mi (116 sq. km). As a Navy base, it is not built for normal cargo operations so that the piers do not have large cranes like a commercial port (http:// www.msc.navy.mil/N00P/pressrel/press02/press02.htm). Caimanera Dock is 132m (435 ft.) long with only 3.6m (12 ft.) of water alongside the facility. Santiago de Cuba—The port is entered between El Morro (Punta Morillo; 19 58’N., 75 52’W.) and the south part of Punta Socapa, 300 yards WNW in the eastern part of Cuba. The bay is quite spacious, well sheltered and land-locked. There are a number of covers and inlets indenting the natural harbor, entered through a narrowed 80m (263 ft.) entrance channel. The city itself, on a hillside at the head of the bay, is the second most important commercial port in Cuba. It is located in the center of a significant mining region. The port has the capacity to operate 13 vessels simultaneously, including tankers, bulk grain, dry cargo and coastal trade vessels. Discharging operations are also frequently carried out at the Inner Anchorage. Reportedly, a roll-on roll-off ramp has been constructed at this port. Also reportedly, vessels up to 214m (702 ft.) in length with a maximum draft of 10.9m (35 ft.) may enter in the morning, while vessels up to 183m (600 ft.) may enter at other times. Its geographic position in relation to the maritime lines that go to and from the Panama Canal, the Caribbean Sea and the north part of South America, give the port the potential to be a transshipment hub. Minerals, agricultural produce, and woods are exported. The city is also the terminus of a major highway and railway. One of Cuba’s most comprehensive port facilities with a capacity of handling over 3,000,000 tons of containers, bulk grain, or liquid cargo. Port facilities are good and able to handle bulk grains, liquids, and containers. The two thermoelectric plants and an oil refinery are the backbone of local and regional industry. Cienfuegos—Cienfuegos is the second largest port in the Caribbean. It is the marketing and processing center of a region producing sugarcane, tobacco, coffee, and rice; it also has rum distilleries and fish canneries. Cienfuegos as the capital of Cuba’s most industrialized province, is a major hub of industry, commerce, and trade. With its expansive, deep bay, the city receives much of the shipping business for goods needed by other industrialized cities in the area. Cienfuegos has enough land for future development and could accommodate Post-Panamax vessels. Four piers are located at Cienfuegos, providing 5 berths ranging in length from 91m to 203m (300 ft to 666 ft.), with depths of 7.9m to 10.1m (25 ft to 33 ft.). Five vessels can be handled simultaneously at these berths. Cargo operations are also carried out in the various anchorage. The maximum length for entering or leaving the port is 213m (700 ft.) and the maximum draft is 11m (36 ft.). Vessels up to 207m (680 ft.) have entered the port without tugboat assistance. However, vessels over 207m (680 ft.) are advised to enter during daylight hours, during slack water and with aid of two suitable tugboats. To assist a transition government in Cuba and meet humanitarian, as well as reconstruction challenges, significant infrastructure investments will be needed in the port systems. This section provides an overview of how Cuba could integrate selective successful components of Estonia’s economic transition and privatization programs to assist a transition government in Cuba to meet humanitarian and reconstruction challenges. In the short-term, private investors and collaborating countries can assist a free Cuba and its citizens by facilitating the acquisition of new and/or used equipment, opening avenues of cooperation between public/ private transport entities and their Cuban counterparts, conducting technical needs assessments, and providing technical assistance to formulate an infrastructure development plan that will identify emergency requirements as well as medium and long-term needs. To address long-term infrastructure needs, elements of private investors and collaborating countries can support a free Cuba in seeking donor assistance from the international community and organizations such as the World Bank and the Inter-American Development Bank to help finance feasibility studies, assess and prioritize needs, improve the operation and financial viability of: upgrade and replace plants and equipment, undertake the privatization program, encourage competition in services, and develop regulatory mechanisms for natural monopolies. Like ports in other Latin American nations, it is anticipated that Cuba’s largest and most important investments will come from the private sector with assistance from institutions such as Inter-American Development Bank (IDB) and the World Bank. Most of these investments will be made for privatization of state-owned assets, and will come from private companies with specific objectives and from capital markets. Cuba’s close proximity to the United States, its underdevelopment and plentiful mineral resources, its educated work force, its top-rated natural attractions, as well as other characteristics, have a positive impact on potential foreign investors. Privatized ports represent the best option for developing much-needed infrastructure within a short time frame. Recommended Action: Private investors and collaborating countries, through their industrial base (private port industry and manufacturing) and the international institutions, including the World Bank and the Inter-American Development Bank, could assist in a free Cuba’s privatization of its port industry. Collaborating countries should be prepared to analyze and advise a free Cuba on port privatization prospects recognizing possible complications associated with Castro-era expropriation policy. Good governance provides an enabling environment for the expansion of trade and economic growth. Current transition strategies have increasingly recognized the importance of well-functioning social institutions as the necessary foundation of a well-functioning market economy. A free Cuba’s transport and logistics integration into the Western Hemisphere will be an important strategic objective. When a transition to a free Cuba takes place, additional investments would be needed for maritime connections, including a program to break up congestion around ferry ports (previously major entry points for American tourists) in order to accommodate the significant anticipated increase in economic and hence transport activity. A priority is to promote the rapid growth of export-oriented private business enterprises and facilitate the development of business management skills necessary for success in a globally integrated market economy. Experience suggests that a regulatory structure that balances private and public interests is necessary in the case of privately owned and operated infrastructure. Recommended Action: Private investors and collaborating countries should focus primarily on providing technical assistance, transferring knowledge and information, and promoting a multinational effort to provide the financing needed to rebuild transport infrastructure that promotes trade and economic development. Navigation has historically been a vital component of Cuba’s commerce and will play an even larger role in a free Cuba’s commerce. Immediate efforts could be directed to the staff at the Ministry of Transportation of a free Cuba and the Cuban Port Association to determine if depths at the major harbors are currently adequate for the ingress and egress of vessels, and the adequacy and accuracy of fixed navigation aids. Anecdotal evidence collected by private shippers reveals that Cuban-reported depths are often unreliable. The immediate needs would only be focused on the major harbors and/or any bottlenecks in the system. Recommended Action: Collaborating countries should offer to conduct navigation facilities evaluation. A significant effort by new leaders to improve the marine transport system will be required to support the rapid growth of maritime commerce expected following a change in government on the island. A free Cuba may require assistance in developing a marine transport strategy to meet the present and future needs of Cuba’s commercial and recreational users in the areas of public safety, efficient movement of cargo, and national security while facilitating recreation and environmental protection. Recommended Action: Collaborating countries should offer technical assistance in these areas. Repair and replacement of equipment is a key maritime infrastructure priority in Cuba. The main facility that handles containers is at the Port of Havana, which presently operates at 60% capacity or less. Additionally, the city of Havana faces congestion problems associated with state-sponsored development of the island’s tourist industry. Recommended Action: (1) Private investors and collaborating countries should be prepared to assist a free Cuba in identifying priority needs for port equipment and investments in port and intermodal infrastructure. (2) Encourage international financial institutions, such as the IMF, the World Bank, and the Inter-American Development Bank, as well as other governments and the private sector, to provide Cuba technical assistance to modernize its ports through capital improvement. Intermediate and long-term efforts should focus on strategic planning to both rehabilitate and enhance the country’s navigation system. In concert with a free Cuba’s Ministry of Transportation and Port Association, navigation modeling should be performed to analyze current and project navigation needs. The modeling results will allow informed, strategic decisions to be made about future navigation investments. Initiation of efforts would be through the in-house Cuban workforce, existing construction and/or Architect/ Engineer (A/E) contracts or the issuing of new contracts, if needed. Work would initially proceed with the assessment of the critical harbors and then move to the remaining principal harbors to determine their condition and needs for emergency actions, and to establish a process for rehabilitation. This initial effort would include surveys of the harbors and assessment of the piers, bulkheads and other marine and support structures. As coordination is established with the Cubans within the framework of the overall development assistance plan, an order of work or priorities can be developed for the assessment of the harbors. Reconnaissance Assessment of Facilities: Through the use of A/E contracts, perform a reconnaissance- level assessment of the critical harbors through the use of surveys, geotechnical studies and inspection of the docks, bulkheads, wharfs and marine facilities as to their structural integrity, maintenance and renewal and replacement needs. Establish a priority point process to rank the deficiencies and criticality of needs. 1. The International Standards Organization specifies standard shipping containers as 20 feet long by 8.5 feet square. The standard unit for measuring container throughput is 1 twenty-foot equivalent unit or 1 TEU. Teo A. Babún, Jr., is the author of more than 100 manuscripts and reports on Cuba businesses, infrastructure, and religion. He is the CEO of ECHOcuba, a non-profit effort that trains Cubans on leadership, free market and democracy concepts. He is an Electrical Engineer, who holds an MBA and a Ph.D. He is a winner of an outstanding alumni award from Michigan Tech University, where he has been inducted into the Electrical and Computer Engineering Academy.